Cécile McLorin Salvant is scheduled to perform Saturday on the Main Stage from 2:50 until 3:50. 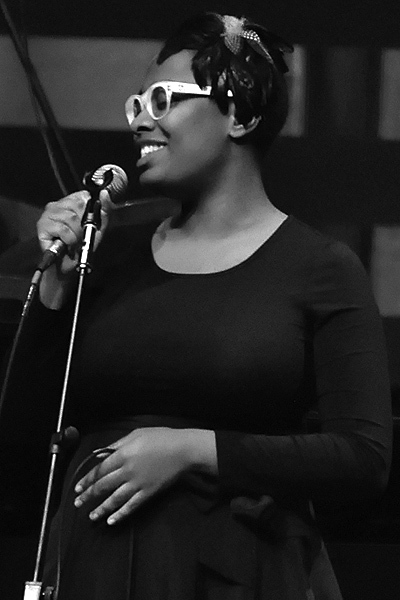 Cécile McLorin Salvant, a 2016 Grammy(r) Award winner and the 2010 Thelonious Monk competition winner, was born and raised in Miami, Florida. She started classical piano studies at age 5, and began singing in the Miami Choral Society at age 8. She has developed a curiosity for the history of American music, and the connections between jazz, vaudeville, blues, and folk music. Cécile carefully chooses her repertoire, often unearthing rarely recorded, forgotten songs with strong stories. She will bring the songs from her Grammy(r) Award-winning album FOR ONE TO LOVE to SPAC. Photo by ataelw [CC BY 2.0], via Wikimedia Commons. 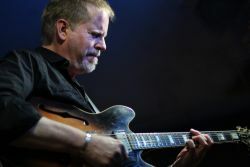 Dave Stryker Organ Quartet featuring Eric Alexander, Jared Gold, & McClenty Hunter is scheduled to perform Saturday on the Main Stage from noon until 1:00, and on the Gazebo Stage from 3:05 until 4:10. Dave Stryker Organ Quartet featuring Eric Alexander, Jared Gold, & McClenty Hunter will make their Freihofer’s Saratoga Jazz Festival debut. Stryker, a jazz guitarist, has recorded twenty-seven albums as a bandleader and has recorded and published over 150 of his own compositions. His 2015 album, Messin’ With Mister T, is a celebration of the man he worked with for over a decade – Stanley Turrentine. The work was named one of Downbeat’s Top CDs of 2015 and earned Stryker his 7th recognition in Downbeat Critics and Readers Poll. Photo credited to Chris Drukker, provided by davestrkyer.com. The Suffers are scheduled to perform Saturday on the Main Stage from 5:50 until 7:00. The Suffers, the Houston band known for their unique, self-coined musical style “Gulf Coast Soul,” will play selections from their 2016 self-titled album at their Freihofer’s Saratoga Jazz Festival debut. In 2016, the band performed for NPR’s Tiny Desk, Newport Folk Fest Festival, Austin City Limits Festival, and The Late Show. 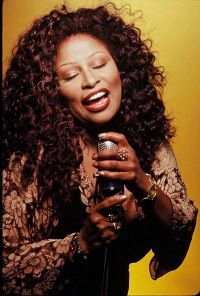 NPR has described their blending of rock & roll, country, Latin and Southern hip-hop music as “a perfect mix of power and delicacy.” Their 10-musician ensemble is led by singer Kim Franklin, whose warm and powerful voice was compared to Chaka Khan’s by the New York Times writer Andy Langer. 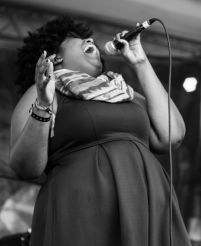 Photo provided by The Suffers’ website. Jacob Collier is scheduled to perform Saturday on the Main Stage from 7:30 until 8:40. Jacob Collier is one of the world’s most distinctive, inventive and prodigious young musicians. Based in London, Jacob has embraced the world of the internet to share his uniquely creative talent. He is best known for his trademark multi-faceted YouTube videos, wherein he sings all of the parts, plays all the instruments, and adds visual elements through a mosaic of video screens. Jacob has spent the last year collaborating with Ben Bloomberg at the Massachusetts Institute of Technology (MIT), designing and building a groundbreaking solo live performance vehicle, which brings his one-man, multi-instrumental, multi-visual format of music making to the stage in a way that has never been seen or heard before. The Guardian heralded Collier as “jazz music’s new messiah.” His debut album, In My Room, released in July, ranked number one on the iTunes Jazz chart in twenty-three countries and debuted at number one on the Billboard Contemporary Jazz Album chart. 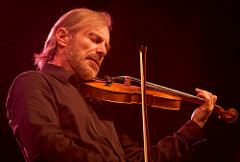 Jean-Luc Ponty is scheduled to perform Saturday on the Main Stage from 1:20 until 2:30. Pioneering jazz and rock violinist Jean-Luc Ponty returns for his 4th Freihofer’s Saratoga Jazz Festival appearance with hits from his Atlantic Records albums including Imaginary Voyage, Enigmatic Ocean, and Cosmic Messenger. Ponty began his career in France as a classical violinist, but quickly developed his own horn-inspired style without vibrato. The recipient of lifetime achievement awards in four countries, Ponty was also awarded the 2016 Officier de la Legion d’Honneur, the highest civilian honor in France. Jean-Luc’s photo at the Nice Jazz Festival in 2008 is licensed via CC-BY-SA 2.0/Guillaume Laurent. 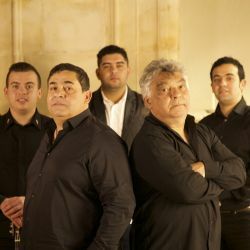 The Gipsy Kings are scheduled to perform Sunday on the Main Stage from 8:35 until close. Photo credited to Marie Claire Margossian-Fotor. The Saratoga TODAY newspaper has published an interview with festival producer Danny Melnick. I learned that the Saratoga Jazz Festival is the fifth longest-consecutive-running jazz festival in North America! Only a few more days until Jazz at SPAC! See you soon! Freihofer’s will be giving away boxes of their signature, chocolate chip cookies and have a full-size, jazz-themed backdrop and photo booth. Stella Artois, sponsor of the “the Hang,” brings a deluxe Airstream trailer to the festival where guests can sample Stella Artois products, relax in lounge chairs and, well, hang. New York Lottery’s exhibit offers you a chance to buy tickets, check your tickets and participate in giveaways and games. Price Chopper is giving away a jazz festival weekend! AT&T is hosting ticket giveaways in its Albany and Saratoga stores! National Grid will have their Sprinter Van at the festival and a number of energy saving exhibits, including the pedal machine which is a hit with kids. The festival is much more than an event, it is a celebration extraordinaire. If you haven’t experienced it yet, this year is your chance! 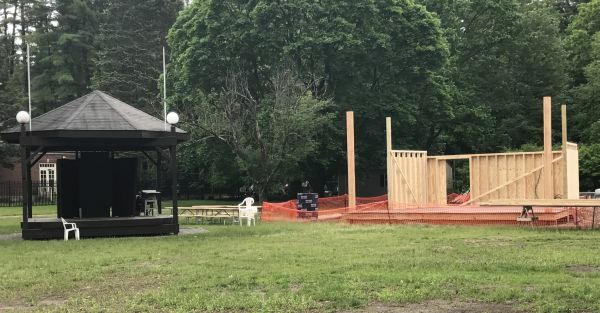 Faithful commenter DJ Jazzy Joe sent me a couple of photos of the new gazebo under construction. It certainly looks much larger then the old!